Ideal uses include, Healthcare, Retail, Travel, Supply chain, Post & parcel. 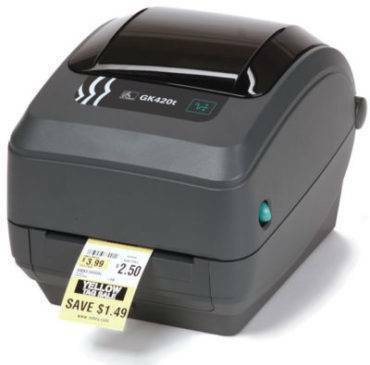 The Zebra GK420 thermal printer provides a proven design and long term dependability. The GK420t thermal transfer printer and the GK420d direct thermal printer are the ideal option for applications that require network manageability and low total cost of ownership. Media Size 5”/ 127mm O.D. Person mounting For use on desktop style surfaces.